The sound of the wind rushing from under the face shield muffled the low, smooth whine of the 50 cc engine. It was still early enough for a crispness to linger in the morning air, before the grueling Midwest summer humidity took over. I meticulously scan the road ahead and relish in a sense of unadulterated freedom riding my Honda Metropolitan. There was just something extraordinarily fun riding a scooter. There was just something about having nothing but two wheels and a motor which separated me from the road brings about a sense of vitality and unexplained joy. It is one of those odd, acquired taste which is impossible to explain to someone who absolutely have no interest in riding. The fun. The thrill. The undeniable vintage coolness of being on a scooter was sparked when I was just a tween binge watching old black & white movies on the television. 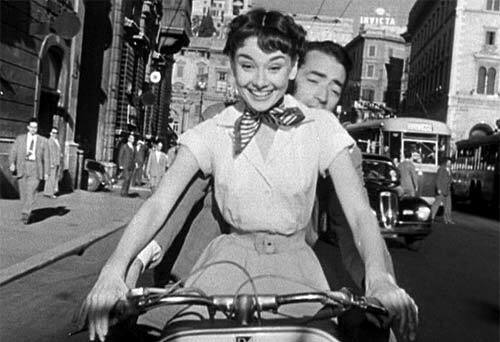 The 1953 classic, Roman Holiday, starring Audrey Hepburn and Gregory Peck was the movie that forever changed my life. Scootering was probably my very first true love. No amount of words can describe the childlike wonder and delight on her face. Perhaps it is magic. Perhaps it is a death wish. But I am willing to wager that one would be hard-pressed to find a scooter rider without a smile on their happy little faces. Perhaps it is just a cult phenomena like Jeep or Mini Cooper. Regardless, I am a fan. Always have been, always will be. I think Robert M. Pirsig said it best in his book, Zen and the Art of Motorcycle Maintenance: An Inquiry Into Values. There may be some truth to being in the world, without being separated from it by a couple thousand pounds of metal and plastic. Granted Pirsig was referring to motorcycles specifically but I think the direct connect with all that is around us can easily be applied to scooter riders as well. The last time I was on a scooter it was the late 1980s. My love for scooters never completely died, but it never was quite enough to do anything about it either. With two little ones, it was difficult to prioritize a want over a need. It wasn’t until I was riding on the Hubs’ new (to him) 650 cc motorcycle that the sense of uninhibited freedom came flooding back to me. This year, the scooter fever took hold of me by both shoulders and gave me a good shake. The kiddos are on the verge of being adults and all the stars seemed to be aligned, beckoning me to the open road once again. So after over a 30+ year break, I bought another scooter. I researched for over 3 years and I settled on a Genuine Buddy 125. *swoons* Yea, that’s mine! My hope is to share with anyone reading is bits of discoveries and ah-ha’s that I have uncovered through a lot of research and trails & errors. I would like to post a Scooter Girl 411 on Mondays but the frequency is still to be determined – why? Because it’s riding season silly! SO please subscribe to get auto updates.